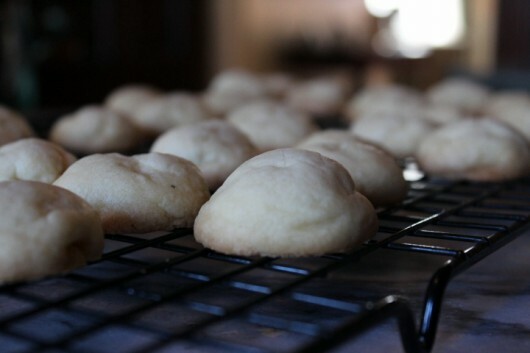 TRUE CONFESSION: I made Cognac Cookies this week, and all I can say is…Wow! These grown-up treats are light, buttery, and gently infused with orange-cognac. If you are over the age of twenty-one, I beg you to try them. They are incredibly easy to make. This recipe begins — as all worthwhile cookie-recipes do — with 2 sticks of butter. Let the butter soften to room-temperature. 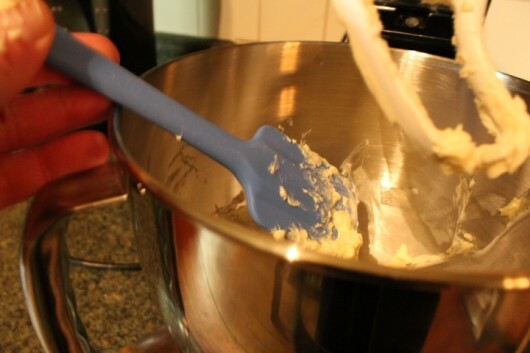 Using a stout wooden spoon, a hand-held mixer, or a standing mixer, cream the butter until perfectly smooth. And by the way, Christmas is coming. 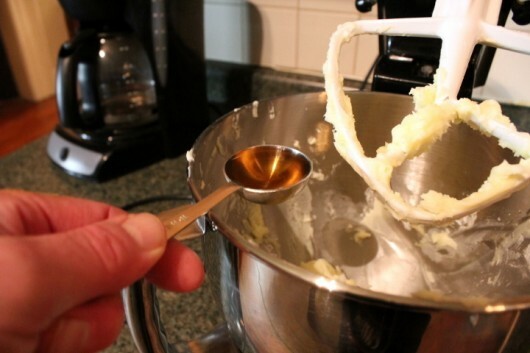 If you don’t already have a standing mixer, by all means ask Santa for one. Scrape down the sides of the bowl with a blue spatula. 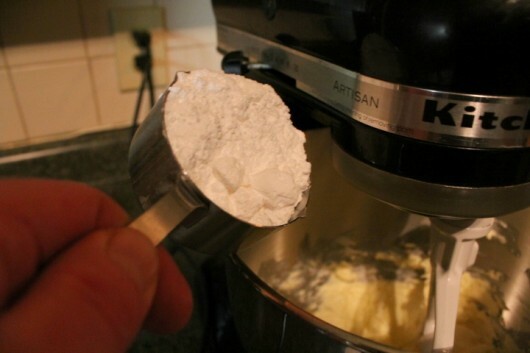 Gradually mix in the confectioner’s sugar. Then scrape down the bowl once again. Is bowl-scraping an aerobic exercise? Why, yes, I think it is. And by the way, I used La Belle Orange — a delicious blend of cognac and orange liqueur — for these Cognac Cookies. It’s expensive stuff, but a little goes a long way. 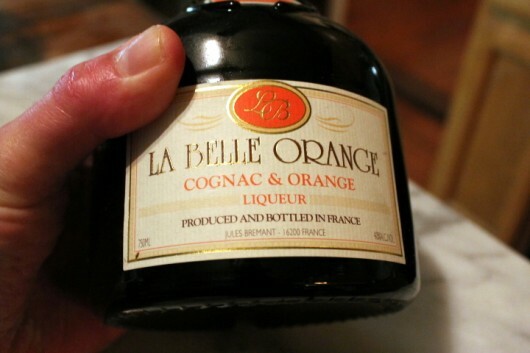 If you don’t have this cognac on hand, you could very well add any high-quality orange liqueur, like Cointreau. I always have Cointreau in the house, because it is an essential ingredient in my favorite cocktail. Bit by bit, beat in the flour. Now scrape the dough into a bowl, cover with plastic wrap, and refrigerate for at least 2 hours. Or, if you are in no hurry, freeze the dough for up to one month. And roll it between your palms to form a one-inch ball. Place the ball on an ungreased baking sheet. 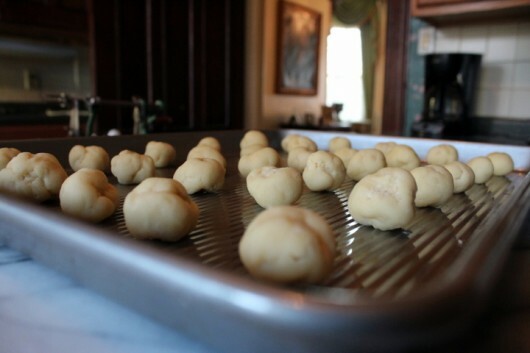 Continue to form the remaining dough (or as much dough as you want) into balls, and space them about 1 inch apart on the baking sheet. I managed to fit 30 balls on my 15-inch by 12-inch baking sheet. And I still had plenty of dough left over for yet another batch. Bake until the cookies just start to color — 20 to 25 minutes. Then slide them onto a wire rack. When completely cool, taste one (like you haven’t already). Delicious, yes? 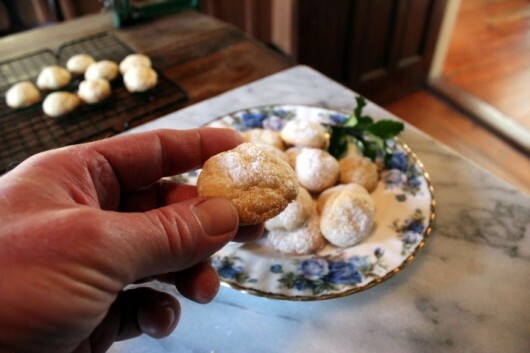 Arrange the cookies on a serving plate or platter, and dust with a small amount of confectioner’s sugar. 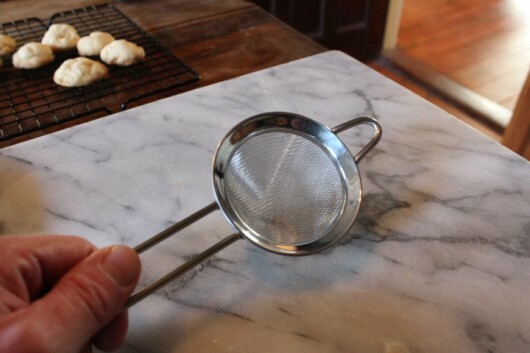 Tip: It’s much easier to control where the “snow” goes if you place your confectioner’s sugar in a cone-shaped, 3-inch-diameter wire-mesh sieve. If you ask Santa-MasterCard for a Kitchen Aid mixer, you might as well ask Santa-Visa for a cone-shaped sieve. I hope you realize I’m kidding. I am not, however, kidding about these cookies. They are amazing. I wouldn’t hesitate to serve them to my most discerning foodie-friends. 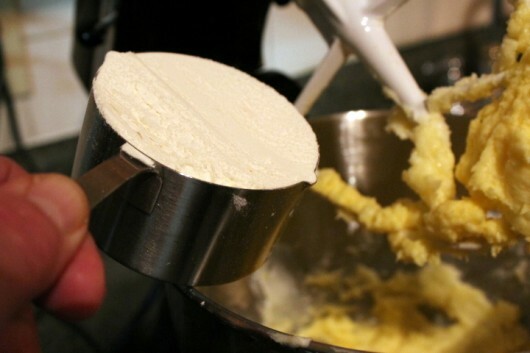 Making the dough – Using a stout wooden spoon, a hand-held electric mixer, or a standing mixer, beat the butter until smooth. Scrape down the sides of the bowl. Then add the sugar, and mix until thoroughly blended. 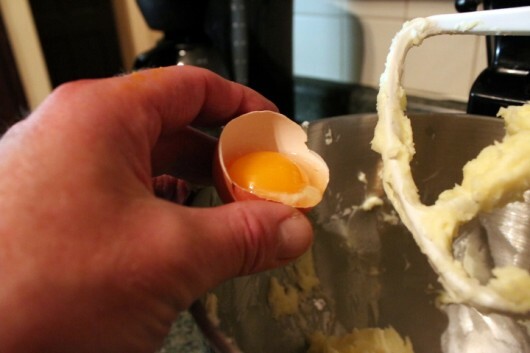 Scrape the bowl down again, and then beat in the egg yolk and the orange cognac. Bit by bit, beat in the flour. 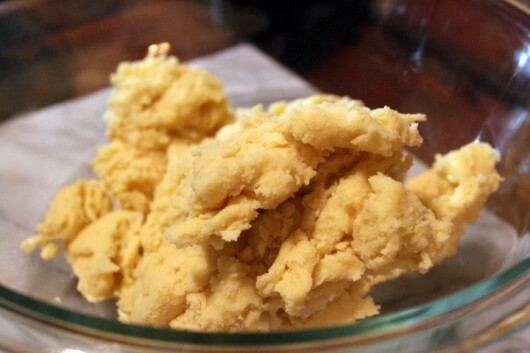 Dump the dough in a medium-size bowl, cover with plastic wrap, and refrigerate for 2-3 hours. Or, freeze for up to one month. 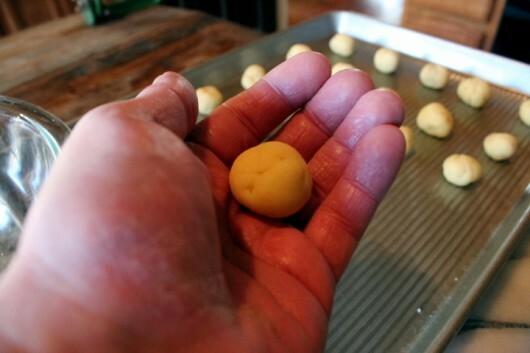 Forming the cookies – Set oven rack in the lower-third position; preheat oven to 325 degrees F. Tear off small bits of dough, and roll them between your palms to form 1-inch balls. Space the balls about 1 inch apart on an ungreased baking sheet. 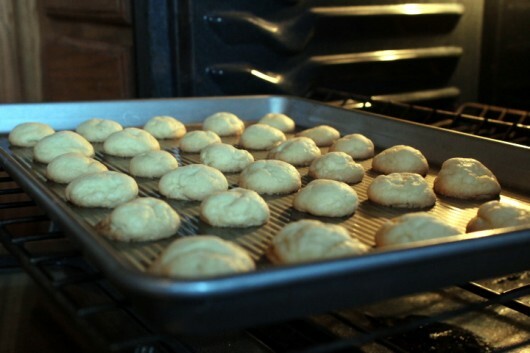 Baking – Bake in the preheated 325-degree F. oven until the cookies just begin to color — 20 to 25 minutes. Let cool on the baking sheet for 5 minutes, and then transfer to a wire rack for further cooling. 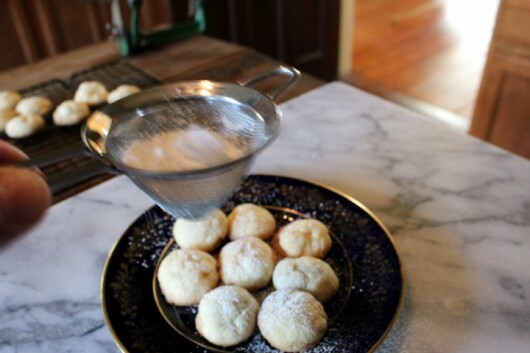 Serving – When completely cooled, lightly (or heavily) dust the cookies with confectioner’s sugar. Well, I hope you’ll try these cookies. They are perfect to serve during the Christmas holidays, or any time. Must I use a blue spatula? I find my red one much more festive! Hosting my 4th annual Christmas “Cookiepalooza” next weekend, this will make the list, can’t wait to try them. But seriously, I have never had cognac and think I must be missing something wonderful, so I must buy some and sip some while making these cookies! I think I’ll make it with Grand Marnier, in honor of Brother Augustine Towey, an icon in the theatre world and former teacher who died on Thanksgiving Day. Hi Paula – “Cookiepalooza” sounds like fun! 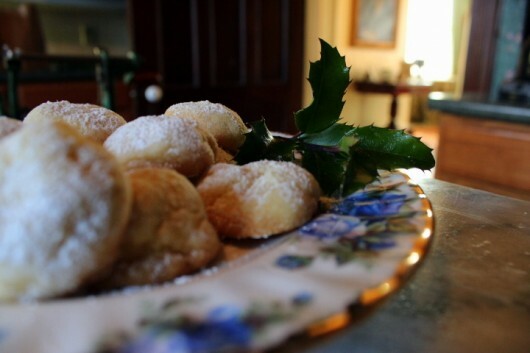 Kathleen – These would be absolutely delicious with Grand Marnier. And regarding Bro. Augustine Towey –what a man! Wish I had known him. I hope you AREN’T kidding! Har har har. Drat. I just started a diet (yet again) so i’ll have to wait to try these. They look scrumptious though, and not unlike a Russia Tea Cookie i used to make! Delicious and easy… sounds like a perfect addition to my Christmas baking list. Hmmm….slipping alcohol into ALL baked goods might be a sign of…? Just kidding. But if you start putting it into omelets we will worry. Have to go, I need a blue spatula. Donna B. 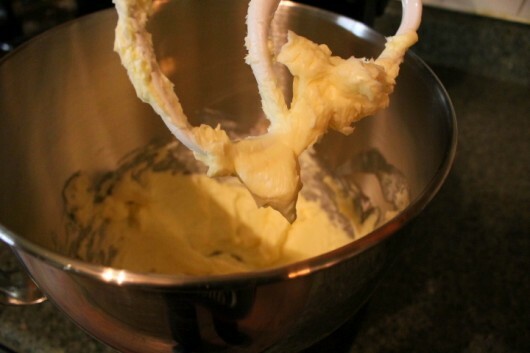 – Ooo, a tangerine-colored stand mixer…love it! Barbara – What will-power you must possess to diet in December. Kudos to you! badger gardener – If you try these, let me know how they turn out for you. Just don’t eat one dozen of them at 8 in the morning as I did. Not all of the alcohol burns off in a 325 oven! Gloria – In a pinch you can use a green spatula. But only in a pinch. I had to giggle a bit (yes, giggle) when I saw the tasty treat you made this week. I giggled at the word cognac. Why? I spent the week trying to find cognac boots to match my cognac purse. I had no idea that there were so many shades of, shall we say, tan? I will continue to look as there must be a pair out there somewhere in the same shade as my purse. The recipe sounds wonderful and I will try it as I have with most of your others. But I will have to find a blue spatula first. :- ) Keep up the good work. Can’t wait to try these. Do they freeze well? I know… They shouldn’t last that long but I like to make large batches and freeze the extras. Also, I think I will try dipping them in just a smidge of fine dark chocolate. I love chocolate and orange together. Thanks for another great Sunday recipe to try. 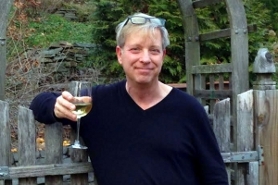 Just wanted to tell you that yours is my very favorite garden blog. It brings a lot of pleasure to my life. I save everyone of them to read again and again. Thank you so much. Diane – Well, now I’m giggling. Imagine…a cognac purse, dark rum shoes, and a creme de menthe hat! Alma – How kind you are! I thank you once again for zipping some of these wonderful little morsels of heaven over to me! They are crisp melt in your mouth perfection! So buttery and wonderful- love them! Could one use triple sec, or some other orange liquour (which I have for making spaghetti a la Cousteau)? Buying a whole bottle of orange congnac to make cookies is out of my budget! Hi Lynne – You could substitute a high-quality orange liqueur, such Cointreau or Grand Marnier for the orange-cognac. HI Kevin – can’t wait to try these, but I have to comment that I find blue spatulas can sometimes delay the baking time and make dough/pastry turn out rather anaemic, rather than golden and gorgeous. I prefer a red spatula and haven’t yet found any negative effects on my baking. Although it might be because I’m in Australia, I suppose. 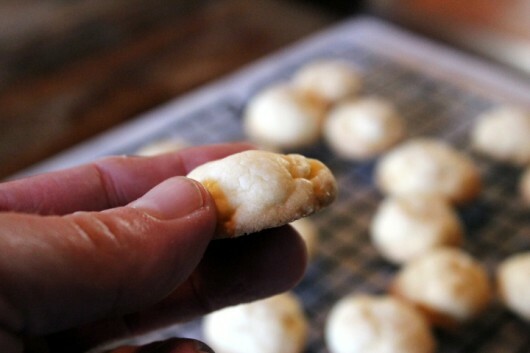 Just finished baking a batch of these heavenly, buttery cookies!! I did use the Grand Marnier since I had it on hand. And, they just MELT in your mouth!! A touch of dark chocolate, oh yeah. I have been looking for a Whiskey Cake recipe for some time. I have tried the Rum Cake using a cake mix (from Bacardi I think). Not quite right. 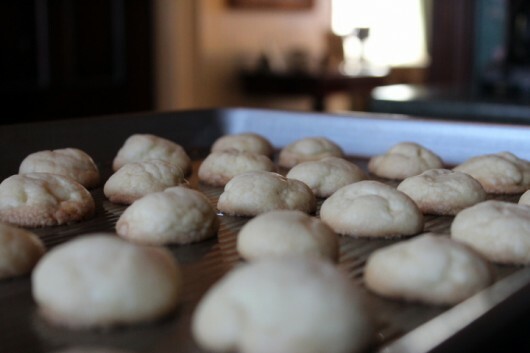 For several Christmases we have received some Jack Daniels Whiskey and neither of us drink it, so I might even try a batch of THESE cookies using JD. But, if you have a Whiskey Cake recipe, I’d love it. Someone made one several years ago, and I just cannot remember who, but it was really good, not too sweet. Love, love LOVE your column, it makes my Sunday morning!! Felicia G – So glad you tried — and liked — the Cognac Cookies. Can’t help you with a whiskey cake (boy does that sound tempting!) but…have you tried my recipe for Apples in Jack Daniels Custard? Truly awesome. Today is a rather cold and rainy day…Apples in JD Custard might just make the day nice and cozy. Thank you for the suggestion–and the other recipes sound tempting as well!! In our household my husband is a baker. A great one, I have to say. So I rarely bake anything because I have to admit I’m a bit intimidated by his abilities. Tonight I got my courage up and baked the cookies. They are absolutely awesome. I can’t keep my husband and myself from eating them all up (they are still warm). Fabulous. Thank you, Kevin. you’re too funny! Thanks for the recipe! Why do you ask for the website, before we can post a comment ? Grazyna – Thanks for making the cookies. So nice to read that you and your husband loved them! Elfrieda – That’s the way WordPress works. If you don’t have a website, you simply type in your name and email address. But I guess you figured that out! Made these at Christmas for gifts…a HUGE hit!! Thank u Kevin!! I love Cointreau and “white” cookies!! I will have to try this recipe!! Thanks so much for sharing!! And yes I have a Kitchenaid Professional 600 that I LOVE!! Just made these and OMG!!! 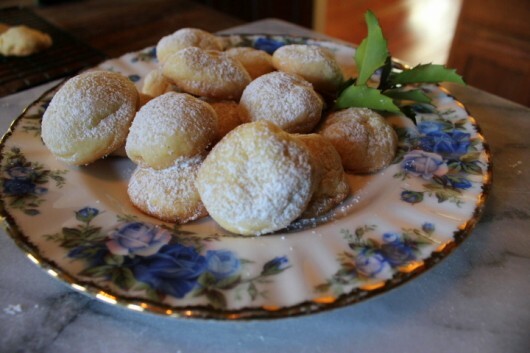 Used 2-3 tablespoons of limoncello instead and they are amazing!!! Kevin…modified to be GF with rice flour and they are superb. Thanks for sharing…er, creating. Happiest of Christmas Holidays to you and yours! These look scrumptious. 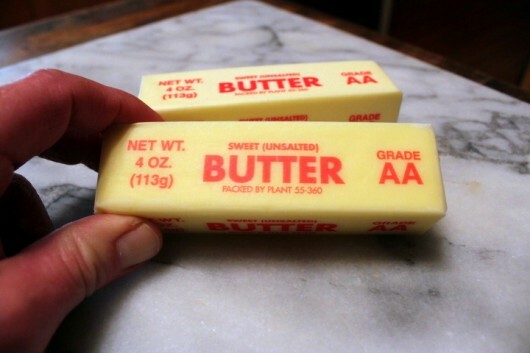 A few questions: Could you explain why some recipes specify unsalted butter, and does it make a big difference? Also, since I have Amaretto on hand, do you think these would work with that instead of orange liqueur? And lastly, since I’m doing without wheat (and feeling loads better because of it), I’ll probably go with a gluten-free flour. Do you have any you recommend? YUMMY….cookies…so many types…so little time…. Sounds wonderful, but how do they store? Well? Possible to bake two weeks ahead of time without losing any freshness? These cookies might get me to go to a liquor store. We are high and dry usually. Oh – I am so making these this weekend! Suppose to be cold here in Minnesota – great way to warm up the house!! Thanks for all of the recipes!!! Your blog fan here comes from a third world….but can cook and bake…however cognac and the likes are quite expensive…but your cookies sound so good….what can I sub for these expensive alcohol? Kevin, I suspect that this time of the year an angel gets their wings every time someone tries one of your fabulous recipes! These will be made for Christmas, no doubt about it. I’d make them this weekend and put in the freezer but I’m not sure my self discipline is strong enough to resist their probable siren song. I always have Cognac in the house and I will be making these!! Thank You Kevin! And a very Merry Christmas to all! Possibly a silly question, but does’t the alcohol content go away during the baking? I’m asking because some of my friends are teetotal. I really appreciate how you take pictures during the process. For those of us that are not kitchen savvy it is so very helpful even though to others it might seem a given how things should look. For Loma: I have used White & Brown rice flour and they both work great–just let them cool before moving them to a rack. 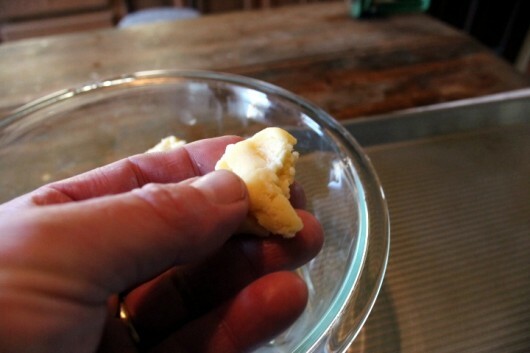 Regarding the unsalted/salted butter question–most pastry chefs prefer UNSALTED butter as you can control how much salt goes into the cookies. And, it is said that UNSALTED butter lasts longer. I buy in bulk and freeze it, so it doesn’t make much difference. These cookies are FABULOUS!! How can I print just the recipe without printing the 24 pages it took to print this recipe????? I make these all the time and people love them. I add orange zest to the dough before I bake them to kick them up a notch!. I even added finely chopped lemon verbeana leaves and lemon zest once to the dough and they flew off the plate at a party! They are buttery and yummy! For Brenda: Go to the area below all the photos, where Kevin put the copy-and-paste version of the recipe. Highlight that recipe (drag your cursor over it) and either press control-C or right-click on the highlighted text and choose “Copy.” Then open a new Word document and paste it onto the blank page (either control-V or right-click and choose “Paste”). Then just print out that out page. I hope that helps. Can’t wait to try these cookies! For dusting things with confectioners sugar, I like to use a spring-loaded spoon that is designed to hold enough loose tea for a single cup. I can scoop the sugar, flick my finger against the edge to make the powder sift out through the holes, then dump the unused portion back into the bag. An easy way to put a last minute dusting on a dessert without making a mess. Kevin, I love the strike-throughs revealing what you really want to say. Laugh-out-loud funny! I just made these and they are truly amazing!!!! As Kevin says, “Easy Peasy” I had to taste one and it was like biting into a sweet cloud. This is a keeper! 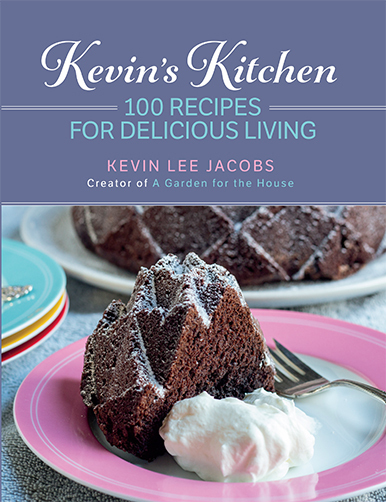 On a different note, you must make Kevin’s “Tomato Pie” I LOVE this weekly newsletter! Love there! But, unless I am wrong, 2 sticks of butter equals one cup. I will make these- but surprised not many ingredients, no backing powder or bak soda? sounds too good to be true.